ISC Surfaces: Glass Mosaics so Green, they're Blue! Oceanside Glasstile is proud to introduce Blue, a new collection of glass mosaics, bricks and liners offering a high percentage of post-consumer recycled content. 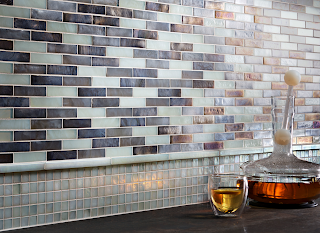 This mosaic line is responsibly manufactured with recycled bottle glass sourced through curbside recycling programs. It contributes to LEED points and green projects with the highest quality, handcrafted mosaics. Two Mosaic Sizes (in inches): 3/4 x 3/4 or 3/4 x 3 3/8 Brick—available in 10 beautiful colors (some monochromatic, some blends) with iridescent and non iridescent surface finish. Three Liner Profiles: available in 6 colors with top edge polished to seamlessly blend where the liner finishes out the mosaic field. Blue is available from ISC Surfaces throughout our entire territory. To see samples of this beautiful line, please ask your ISC Surfaces Sales Representative or visit one of The Gallery locations. More information and photos can be found at the Blue website here.